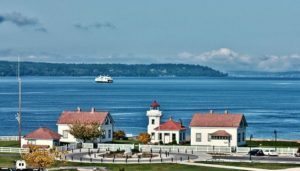 The waterfront community of Mukilteo, Washington lies in the northeastern region of the state. The name comes from the Snohomish language and means “narrow passage,” which describes the entrance to the sandy shore. Other interpretations believe the name means “good camping ground.” Europeans initially arrived in 1858 to establish a settlement. In the early years, the location was a fishing village and port-of-entry. The surrounding woodlands attracted lumber companies. Today, the destinations continually attract new residents for the scenic beauty, amenity options and recreational activities. Mukilteo LighthouseThe 17-acre state park and lighthouse are found in Old Town. The structure is registered in the National Register of Historic Places and remains a beloved community symbol. The multi-colored Victorian-style building stands 38 feet tall in height and is functional to this day. Guests may climb the tower to see the massive carved-glass Fresnel Lens that helps mariners navigate local waters. The tower also provides visitors with a commanding view over the 1,500-foot shoreline and beyond. The location also features boat-launch ramps, picnic and BBQ amenities. The waterfront additionally boasts a number of restaurants and watering holes. The Boeing factory has been constructing aircraft in its local factory since 1943. The facility is known for manufacturing the 747, the 767 and the newer DreamLiner/787. Touring the Future of Flight Aviation Center enables guests to witness the company’s past future, present and future projects. Exhibits explain the impact of commercial aviation in the country. Other displays allow guests to digitally create and test their own jet or ride in the XJ5 Flight Simulator to travel at supersonic speeds. A bus then takes guests to see where the largest planes in the world undergo assembly. Tours are offered by reservation. The stunning white tower bears a bronze origami crane and is found in Centennial Park in Old Town. The monument commemorates the arrival of Asian immigrants from the early 20th century who made their home here, obtained employment and contributed to the community. Today, more than four generations of Japanese and other Asian people enjoy calling the destination home. The location is rated as being one of the top 10 courses in the state of Washington. The golf club features a scenic 18-hole course that offers spectacular views of the area. Players of all levels of experience enjoy golfing here. The club additionally has a full-service Pro-shop and a restaurant. Instruction is also provided by local professionals. Old Town lies in the heart of the city and is considered the dining and shopping district. Harbour Pointe is situated on the southern edge of the community and represents the residential area. However, there are many shopping and dining options here as well. The location features a well-maintained village green, a charming clock tower and a park for outdoor activities and picnics. Dining options throughout the community are plentiful. Eateries offer a wide range of cuisine options ranging from fresh seafood, American fast food and Asian to European fine dining options and specialty snacks. All day long, the local green and white ferries sail through the waters across Puget Sound from the community to Whidbey Island and other island communities. The vessels are large enough to accommodate passengers, freight and vehicles. The trip takes a mere 15 minutes. Canoeing, kayaking and sailing are popular water-based activities enjoyed by many around the Puget Sound. Camping options are also available. A local diving company also offers the chance to go scuba diving close to the shoreline or out on open ocean diving excursions. Perhaps consider a whale-watching tour. The Washington state county has miles of hiking and cycling trails both in local communities and in the nearby Cascade Mountains. The mountains are also popular in the winter for skiing and other seasonal sports. The four rivers that meander throughout the region along with the Puget Sound provide the perfect location for catching salmon or trout in addition to serving as home to many species of wildlife. River rafting adventures appeal to many. The Puget Sound community lies approximately 25 miles from Seattle. “Money” magazine twice ranked the location in the top 10 of the country’s best small towns in which to live. The town’s crime rate is far below the state and country average, which makes the location an ideal place to raise a family. As of 2015, the population was 21,226 full-time residents. The culturally diverse community is predominantly Caucasian. However, people of Asian, Hispanic and other ethnic origins also make their home here. More than 50 percent of the adults have an undergraduate degree. More than 18 percent possess a graduate or professional degree. The town did not experience dramatic population growth until 1980 when the community’s borders expanded. Home and building construction spans from the 19th century through the 21st century. As of 2016, the U.S. Census reported that the average annual household income was $105,796. As of January 2018, the average cost of a residential home was $502,400. The average monthly cost of renting a three-bedroom, two bathroom home was $2,300. Contact our office for an accurate analysis of your rental property. Our property management team specializes in residential areas throughout Mukileto, WA. We offer multiple services to take your rental property and convert it into reliable income. We have a thorough screening process that helps to identify the right tenants for your property. Our team works hard to keep both parties happy through effective communication, bullet proof lease agreements, and timely monthly rent collection. We offer maintenance services to enhance the property and ensure that it will retain or increase in value. We oversee everything, allowing you to sit back and relax and know that your property and your tenants are in good hands. Contact us today if you are ready to receive a comprehensive analysis of your rental property and to inquire about our Mukileto area property management services.